Ludei is shutting down their serivce Cocoon.IO. All members have been notified by mail. If you want to migrate to Cordova, you find a guide here. Thank you Ludei, for your outstanding platform. It was an honor working with you! 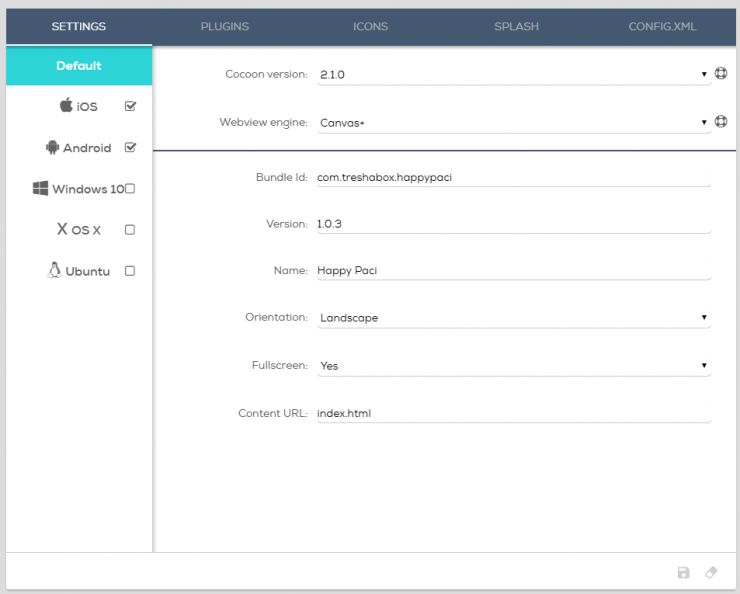 CocoonIO is the latest service from ludei to compile your HTML5 games to Android or iOS. Up to now Ludei offers the best performance with their unique Canvas+ engine. 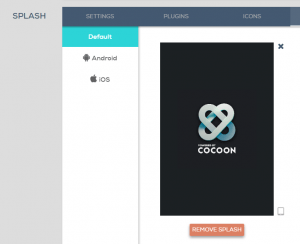 With CocoonIO it’s now even possible to add addtional Cordova & Phonegap plugins to your project. If you want to learn more about ludei’s CocoonIO then check out following links. This is a simple video made by me, but sadly without tone. I hope it helps you to understand the basics. For a more detailed guide, please use the one below. Thank you! 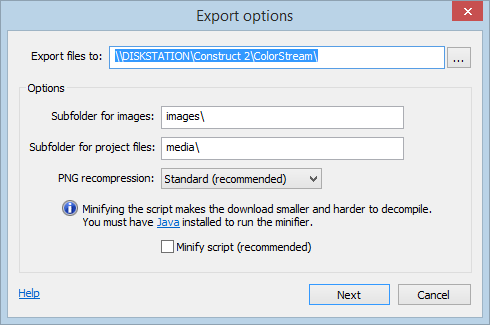 You can add and maintain 2 projects with the free plan (file size is limited to 50 mb). If you want more, you can check out their upgrade plans over here. I also provide some content & tutorials for the new Cocoon Helpdesk. You can find it here. If you miss something here or in the offical doc files, let me know! What are the benefits from this new technology? To sum it up, these are the most important benefits from Ludei’s CocoonIO Service. In the following guide I will explain how to compile an app with CocoonIO from scratch. I’m using Construct 2 to build my HTML5 Games. But you can do this with any HTML5 Framework. 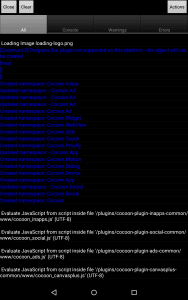 With CocoonIO a new or better more new plugins for Construct were released by Ludei. If you build your games with CocoonIO it’s recommended to remove the old ‘CocoonJS’ plugin from your project and to replace the events and actions with the one provided by the new plugin. This download link has always the latest files and directly downloads the zip file! 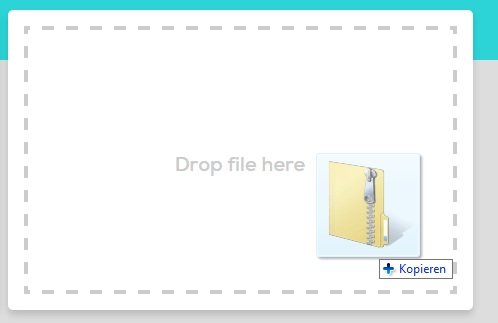 Download the zip file by clicking on the ‘Download ZIP‘ button at the right sidebar. Important! 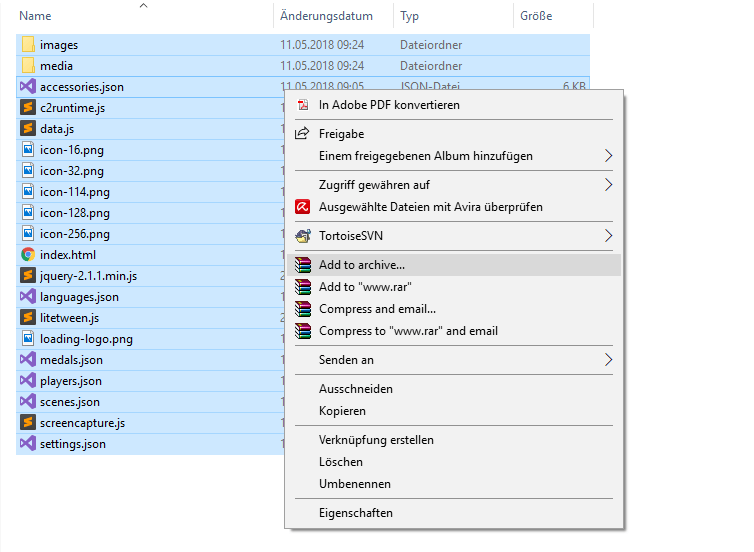 Do not copy the parent folders like “ads”, but instead enter the folder and copy the “cocoon-ads” folder! Close Construct 2 for the following steps. Then open Construct 2 and check if all plugins are available now. Note, if you add any CocoonPlugin, expected the CocoonCanvasPlus Plugin, you also must install the corresponding plugin later in the Cocoon.io – Plugins section, too! Otherwise you’ll get a Black Screen Error. Basically you don’t need to make adjustments to your project if you already use cordova plugins (for example from cranberrygame). You can directly export it the way it is. If you want to compile to canvas+ (what I recommend) you must replace all ‘Browser’ functions like ‘Close Browser’ with the events and actions provided by the new Atomic Plugin ‘CocoonCanvasplus’. Also if you are still using the old ‘CocoonJS’ plugin, replace it with the new Atomic Plugins for Construct 2. You find an installation guide here. 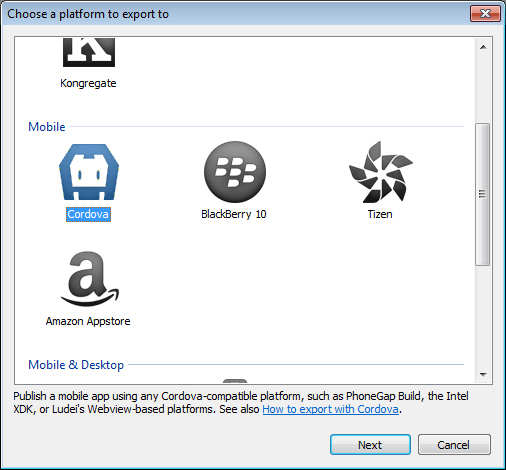 Open your project in Construct 2 and choose ‘Cordova‘ as exporter. Uncheck the “Minify script” tick! This may cause blackscreens in your game. Please make sure the “Use new Intel XDK project format” tick is checked. 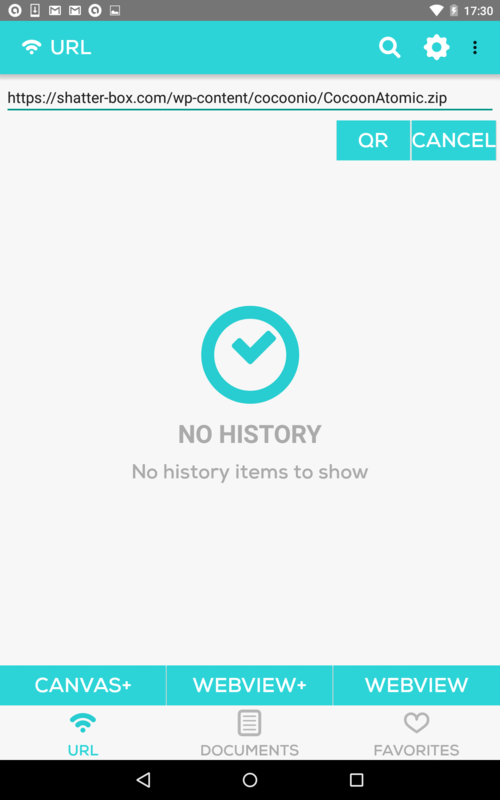 As result you will get this folder structure and content. For cocoon, only the “www” folder is important. So enter the “www” folder and zip the content. If you have not selected the tick for “Use new Intel XDK project format“, please perform the steps below. 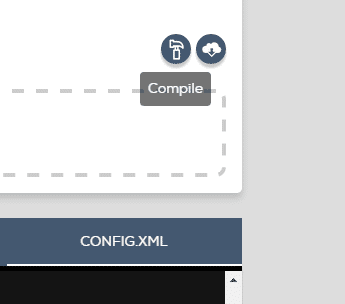 The ‘intelxdk.config.additions.xml’ file only will be added if you use some sepcific plugins, like the ‘Browser’ object or the ‘Cordova Dialog’ plugin. Eventually zip all remaining files. This zip file is for uploading in the next step. 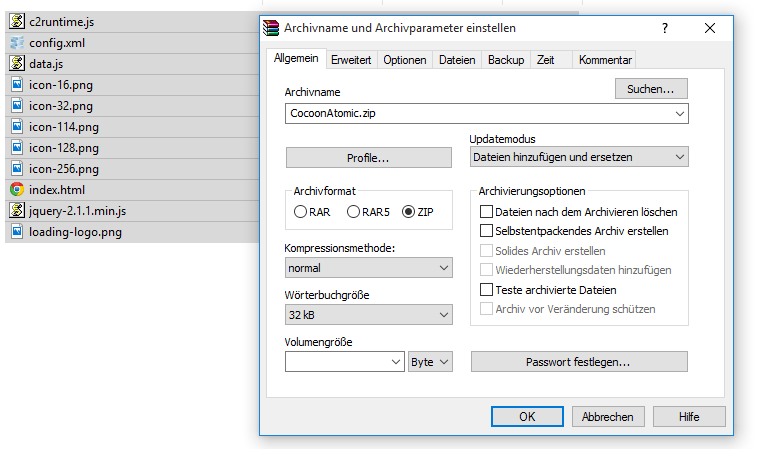 Login in and create a new project by uploading the zip file from the previous step. 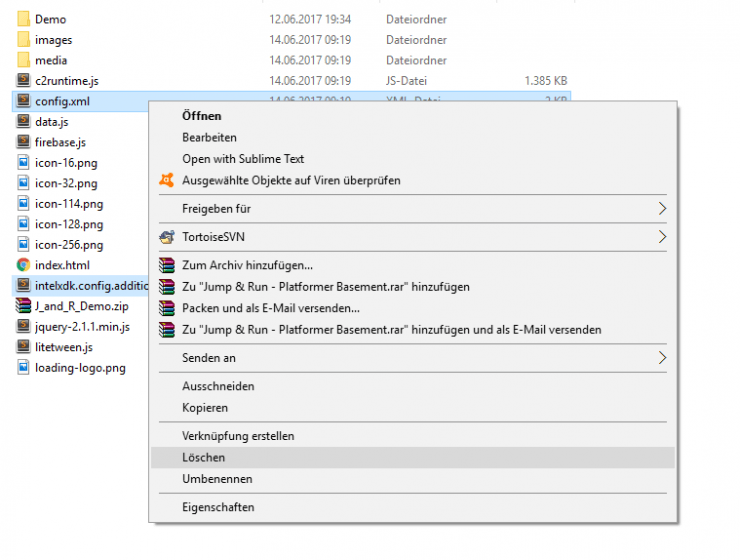 Just Drag’n’Drop the ZIP file in the area ‘Drop ZIP or Upload’. Your project will then be created. After that, open the project and visit the ‘Settings’ tab and enter your details. Don’t forget to save the settings by clicking the small icon in the right bottom corner. Visit the Plugins tab in order to install all needed plugins. For all cranberrygame plugins, add the “Git Repo URL” at the “Custom” section. 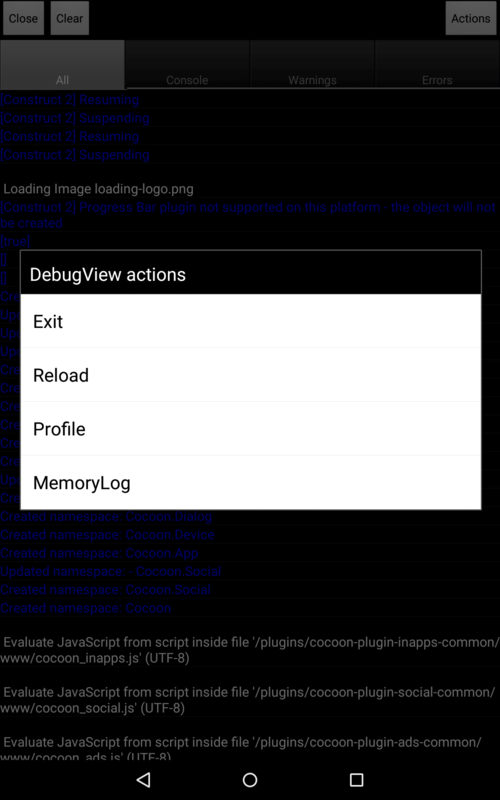 Install here ALL cordova / cocoon plugins which you are using in your Construct 2 project. Otherwise the game starts with a black screen! CocoonIO allows you to upload signing keys to directly sign and align your game. Depending on tthe platform you will need diffrent key formats. First go to to your CocoonIO Profile and select “Signing Keys” or click on the link below. 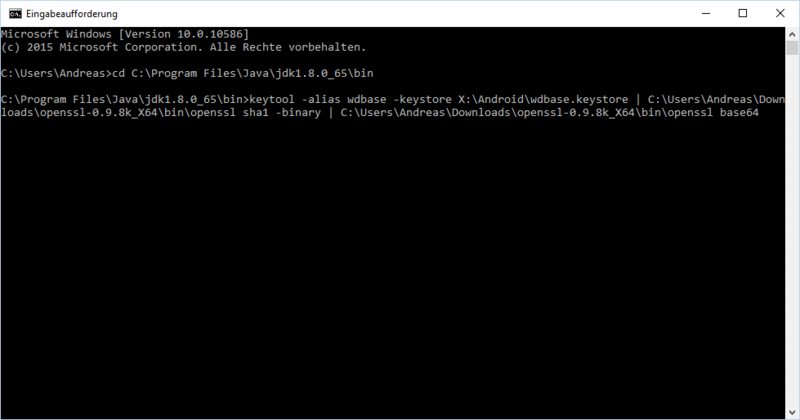 If you are not familiar what a keystore file is, please visit this tutorial and create a new keystore file. Then select Android and click on ‘Add Android Key‘. Now enter all your information needed. Firstly you need to create your certificates in your Apple Developer Account. You’ll need a certificate for Production and for Development. Just click on the corresponding tab (Development or Production) and follow the steps to create a certificate for it. 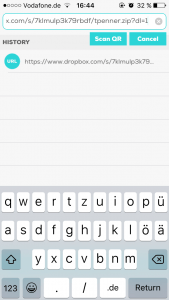 It’s not necessary to add an iOS key to your CocoonIO Account. 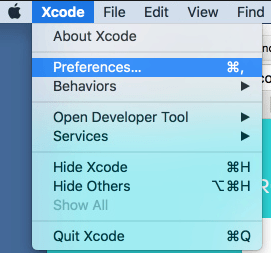 If you do not select any key, you’ll get a xcode archive file. Open this with XCode and you can export your Game for production / development as well. But if you do add a a key, you will directly get an .ipa file. 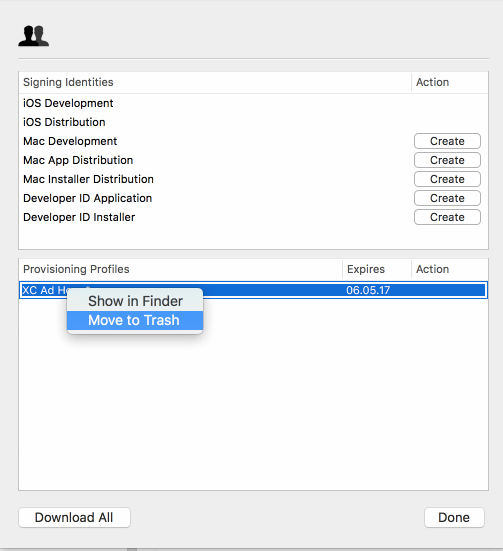 In order to get your Provisioning Profile open XCode on your Mac Computer and select Preferences. Then select your Developer Account and click on View Details. Then perform a right-mouse click on your certificate and click on Show in Finder. Hint: Rename it for better identification. Open the Keychain Access application (in the Applications/Utilities folder) and select your certificate. 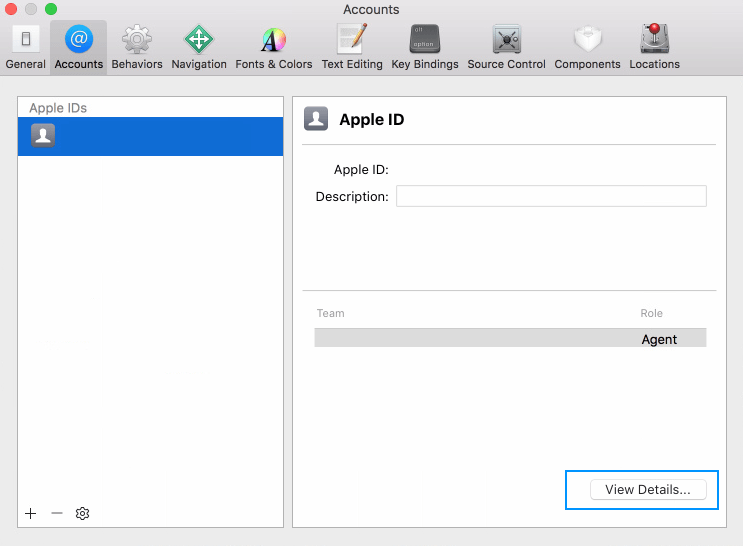 If the shown entries are missing, download your certificates from your Apple Developer Account first and then perform a double click on the corresponding certificate. This will add it to the Keychain Access App. 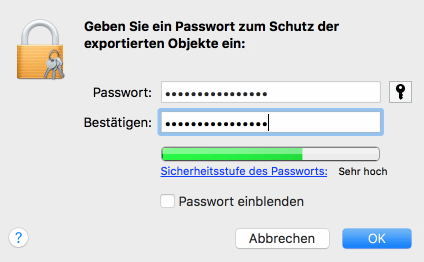 Perform a right mouse click on the corresponding certificate and choose “Export”. Give it a proper name, so it can be identified later. Then add a password. 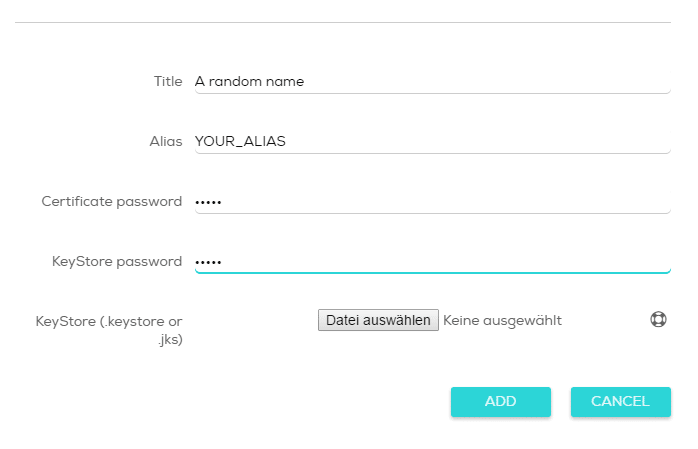 This password is the password you have to add later on CocoonIO! Always use a Distribution Provisioning Profile and a Production Signing Certificate. Now add all your details and click Add. I recommend Canvas+ due it’s awesome performance and small file size. But in the end, it’s up to you what to choose. You can change this at the ‘Settings’ tab. Select your key from the list below. If you have not added a key yet, go to the chapter “Keys & Certficates” above. After that, go back up and click on the small ‘Compile‘ button and your game will be compiled. You will be notifed via mail when the game is ready. You will find also the download link to your files in this mail. Download, unzip and test your app. When you are satisfied, upload it directly to the store. Please visit this topic at the cocoonio forum. 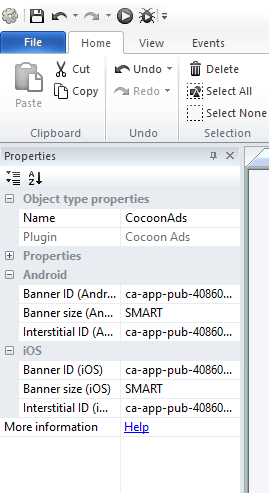 The Cocoon Construct 2 plugins (Ads, Canvas+, Facebook, and so on) doesn’t work in your browser preview. Therefor you need to export your game with Cordova, zip those files and run the zipped game files in your Developer App. The developer app represents exactly your game. It has the same Bundle ID and Version code. Otherwise you could not test services like InApp Purchases or the Google Play Game service by Google. 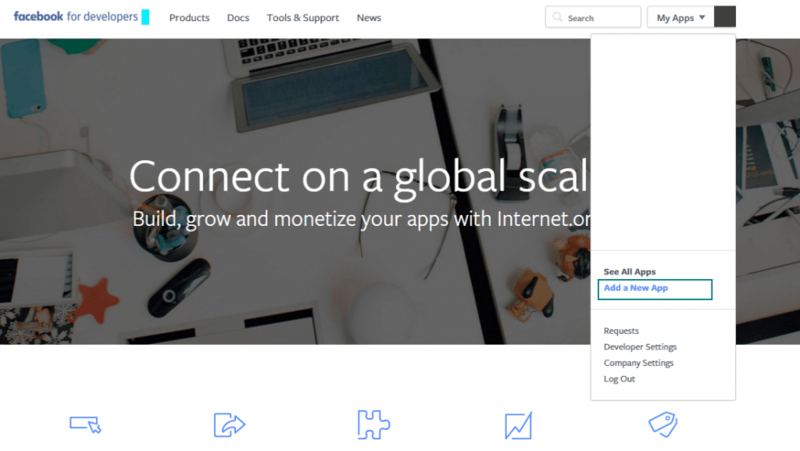 You can create a developer app for each project at cocoon.io. Note: Like mentioned above, the Developer App has the same properties as the live apk file later, so it will overwrite your existing installation (if you have an older version of your game installed). Click on ‘Compile Developer App’. This may take awhile. Once the app is ready you can download it here. You also get notifed via mail. Then you can download the Developer App directly to your phone and install it (the most devices are working with the ARM version). If you want to test your game on iOS you can download the official iOS Developer App from Ludei. You can download it below. 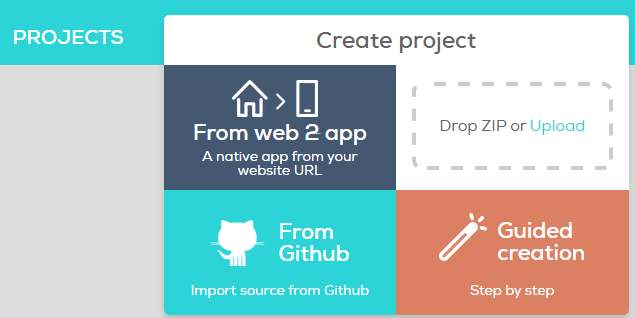 You also can create your own developer app. It works like on Android. Before you are doing following steps make sure that you have installed the Developer App on your device. 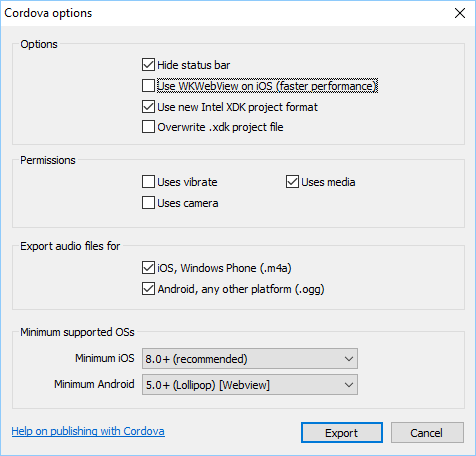 Open your project you want to debug with Construct 2 and export it to Cordova. Open the folder where you exported the files. The plugin information are already included in the Developer App, so you don’t need those two files above. It’s very important to test your game in the Developer App first, so you don’t have to compile a new apk file for each little changes. Also if you stuck and you cannot locate the issue, will the Developer App help you to find and fix the issue. 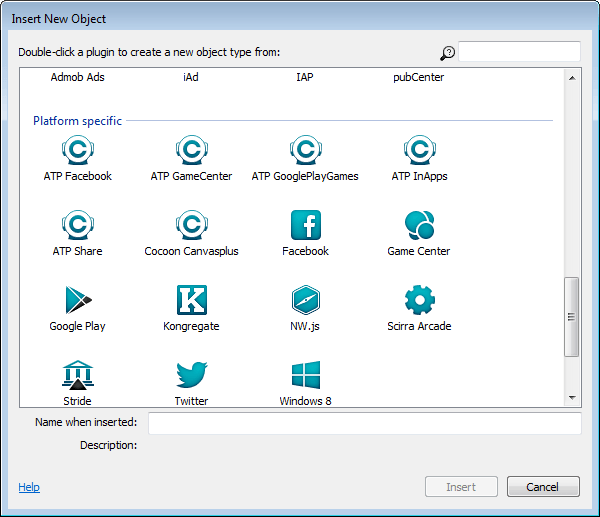 For this you can use the “Browser” object provided by Scirra in Construct 2. This plugin has the action “Log”, so you can log events in the console while running the game in your Developer App. 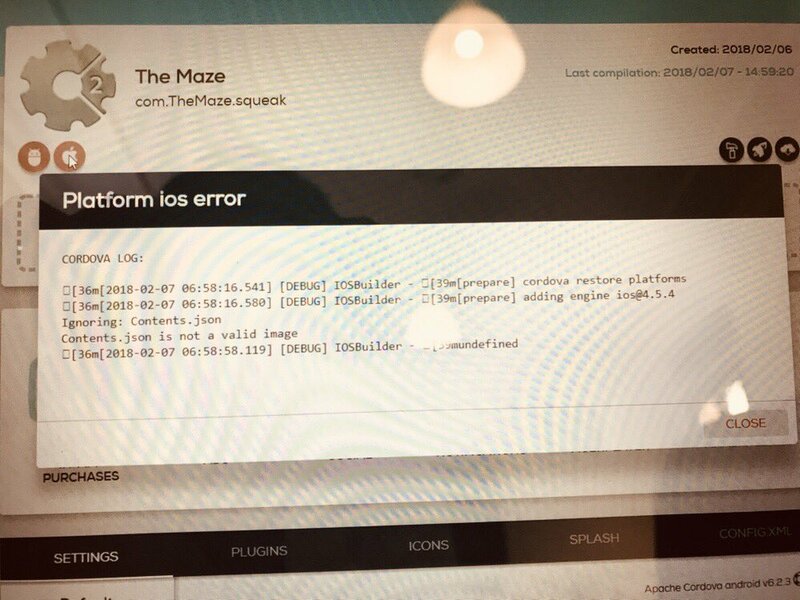 If you now run this game in your Developer App, you can see the events in the console log. If you have performed all steps above you can zip the content and upload it to your test device (where the developer app is installed). 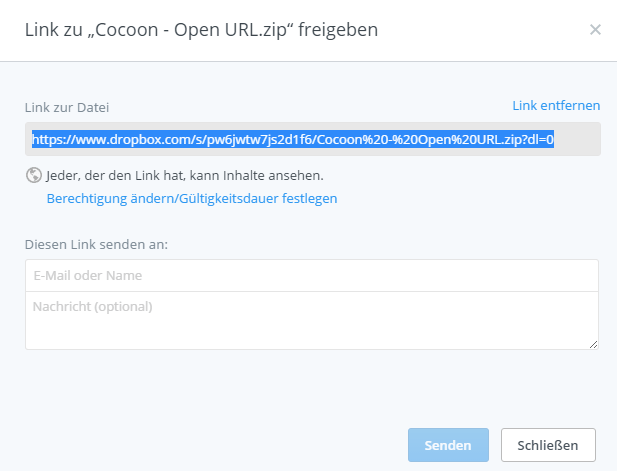 Alternatively you also can upload the zip file to a web server or your dropbox account and load it via an URL. If you use the iOS Developer App, it’s much easier to run it from an URL. Then choose the engine you want to use. I personally recommend Canvas+ due it’s awesome performance. In the upper left corner you can check the current performance (FPS, frames per second). Now you’re able to debug your app without compiling it. This makes the whole process much easier than compiling each changes. The Developer App comes along with a debug console. There you can see the log (Warnings & Errors). Here you find some information how to run your game via an URL. Maybe you have to copy the URL in a text editor first. Copy your link and create a QR Code from it. *) Your custom splashscreen will appear after the cocoon default splash screen. For iOS the icon has to be a square! The icon will be cropped automatically, so there is no need to use any templates to get Rounded Corner icons. 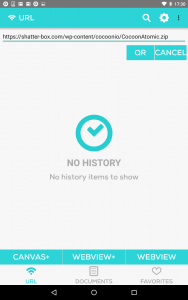 Actually your Binary gets rejected if you upload an icon with rounded corners. You can remove the Ludei “CocoonIO” splash screen for a fee. This must be purchased for each project (bundle ID) individually. Just visit the “Slpash” tab of your project. If you remove the Splash Screen it’s recommended to add an own Splash. Otherwise you get a gap of black screen on each start. It’s better to show a splash screen while the game is loading in the background. Set the time to 3-5 seconds. Some uses have expired some black screen gaps of 2-6 seconds shown after the “Cocoon” splash screen was shown. To avoid or minimize the gap time, you can add a custom loader layout in your C2 Project. For this apply following settings to your project. You can make a custom loader bar or just show your splash on that layout. That’s completely up to you. Then switch to the event sheet of the Loader Layout and add following line. You find a complete guide over here. Add the ‘CocoonAds’ plugin to your project (you must have installed the AtomicPlugins by ludei). 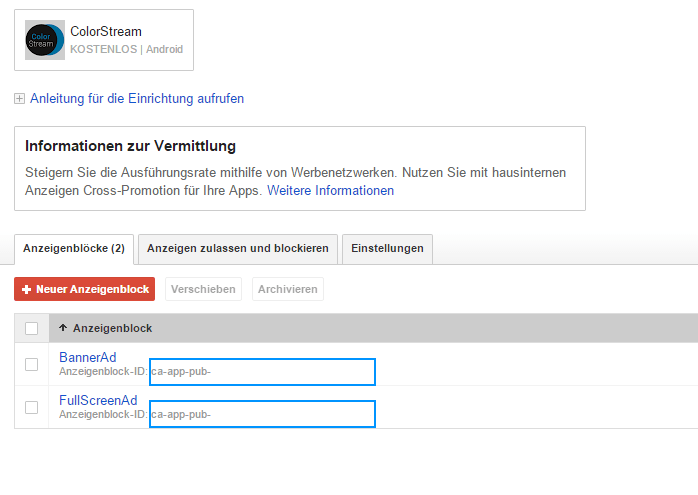 First of all we need to add our ad ID’s (AdMob). When you are logged in into your account select the app from which you want to use the ID’s. 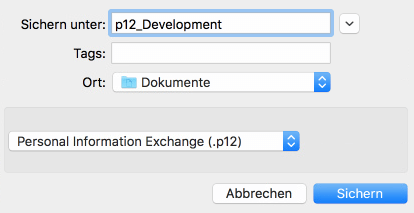 Copy both ID’s and insert it to the CocoonAds Plugin in your C2 project. If you use the CocoonAds Plugin in your Construct 2 game, please make sure that you also install the corresponding plugin in the Cloud Compiler under Cocoon.io – Your Project – Plugins! It’s called “Native AdMob for Android” or Native AdMob for iOS”. 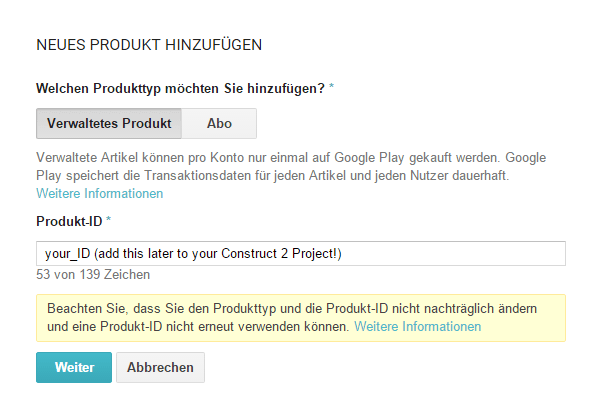 Add the ‘Cocoon GooglePlaysGames’ plugin to your project (you must have installed the AtomicPlugins by ludei). In order to use the Google Play Games Function in your game you must have uploaded an apk file to the Play Store (beta phase). First visit your Google Play Developer Console. If you don’t have an account yet, create one. The fee for a new account is 25$. This is a one-time payment. 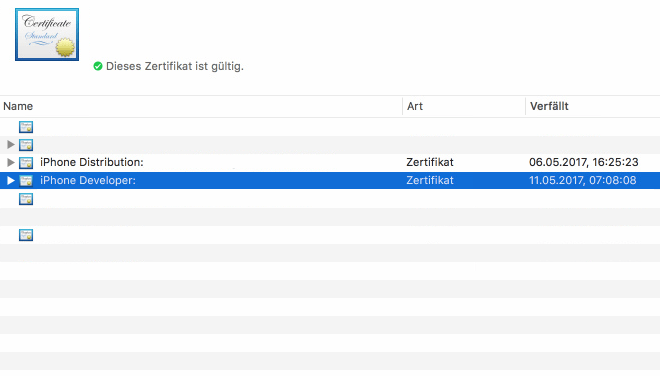 After that, there are no recurring payments to made like on the ITunes Store. In order to upload an apk file to the store you must compile it first. 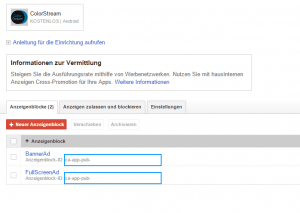 If you already have created an app at your Google Play Dev. Console you can skip this step. 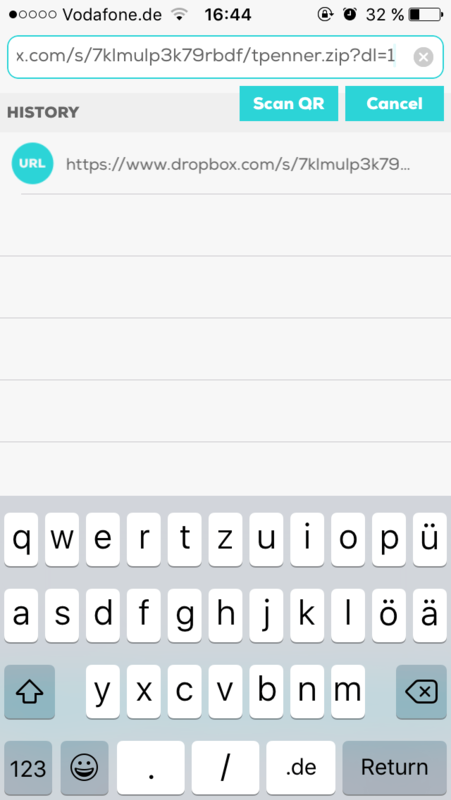 Click on ‘All Apps‘ and then on ‘+ Add new App‘ (in German: + Neue App hinzufügen). 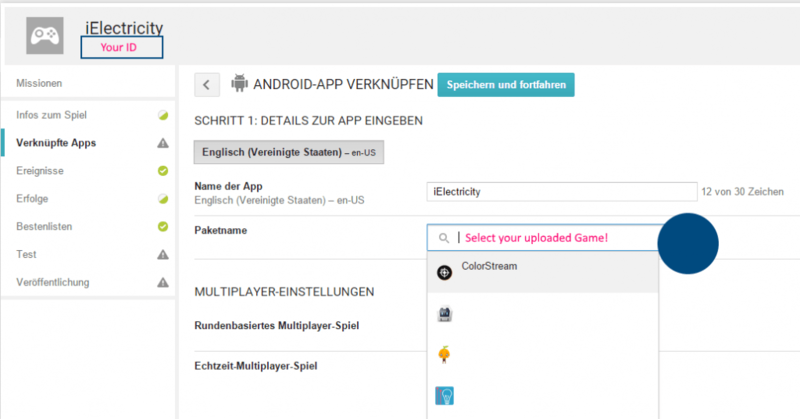 Enter the title of your game and click on ‘Upload APK‘ (in German: APK hochladen). 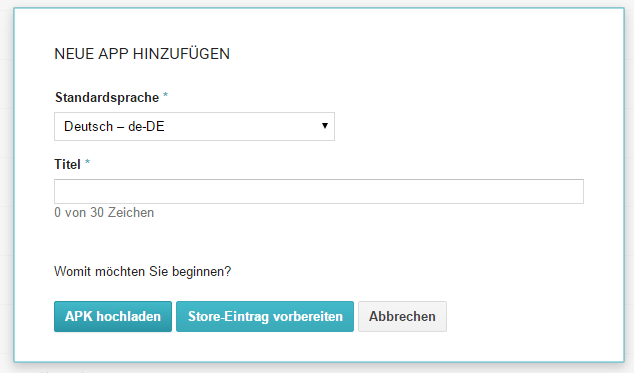 Now switch to the ‘BETATEST’ tab and choose ‘Upload first APK-File in Betaphase‘ (in German: Erste APK-Datei in Betaphase hochladen). If the upload was successfully it will take awhile till your app is reachable via the test link. Then enter the details of your game. It’s recommended to use the same name that you used on your game. 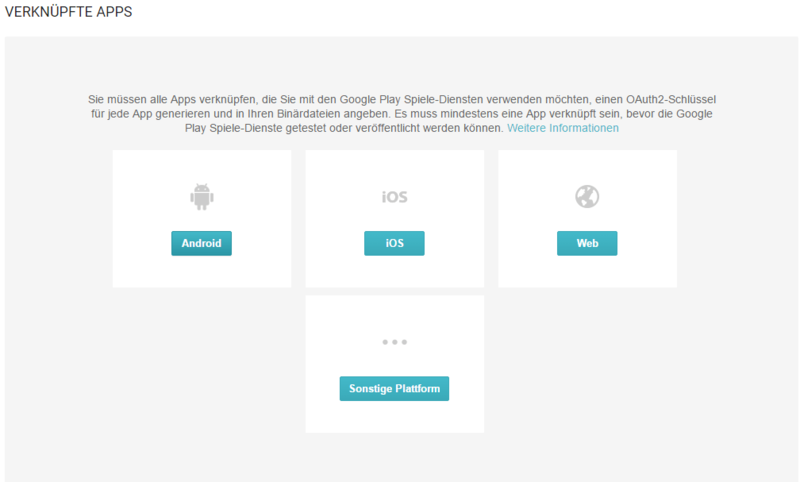 Click on ‘Next‘ (in German: Weiter) and go to the tab ‘Associated Apps‘ (in German: Verknüpfte Apps) and select the platform you want to associate with the current game service. 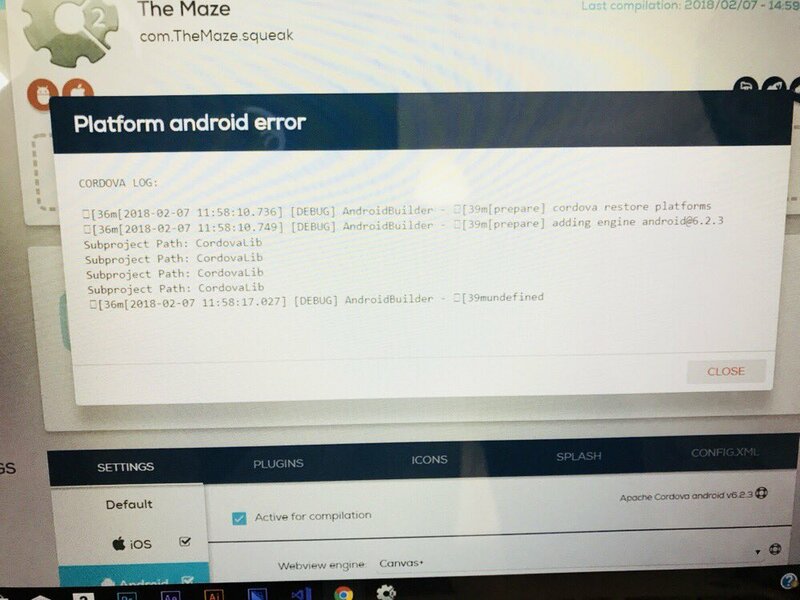 I want to add an Android game, so I choose Android as platform. You find your ID in the header below the name of your game (marked in the blue rectangle). This is your Google Play Game ID. If we use later this term then we refer to this ID. In order to select your recently added game you must have uploaded an apk file before (note that it may take awhile till your game is shown here). 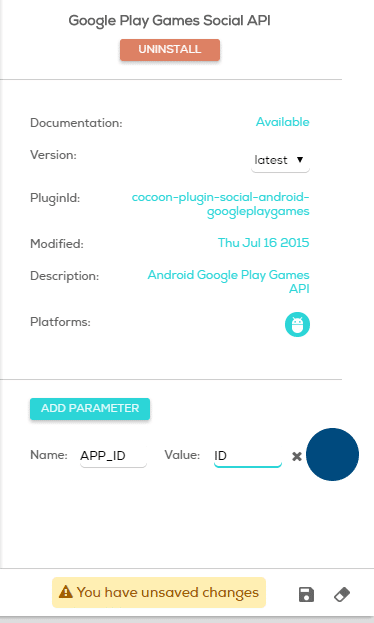 Copy your Google Play Game ID and change to your CocoonIO Account. 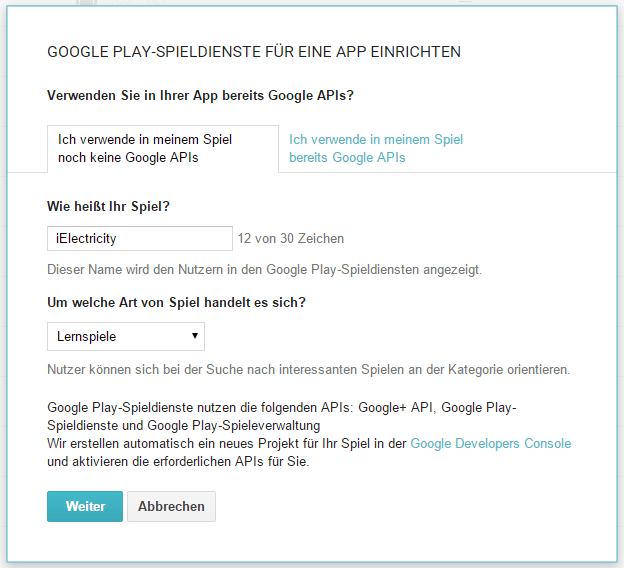 Then select your Project (if you have none, create one) and click on the tab ‘Plugins‘ and select ‘Cocoon‘, search for the Plugin ‘Google Play Games Social API‘ and click ‘Install‘. The installer will create automatically a parameter called APP_ID. Insert here as value your Google Play Game ID. Do not use the CocoonGooglePlayGames & Cranberrygame’s CordovaGame plugin at the same time in one project. This will cause build errors. Eventually you can compile your game. In order to do so, select the “Leaderboard” tab and then click on “Add new Leaderboard”. Then give your leaderboard a name (can be anything) and choose the format for the score. If you select a decimals create then 0, you must beware of how you have to submit the score then. You need to submit scores as integers, which are then being transformed according to the decimal places you’ve set up in the Google Play Developer Console. Thanks to JG_Development to let us know about this. Then deactivate the tamper protection. Otherwise only your own score will be shown in the leaderboard. When you feel ready, save it and copy the ID. This is the ID you need to use in your Construct 2 project for “Open Leaderboard“. If you call “Open Leaderboard” and do not submit a ID, it will show all available leaderboards for your game. So if you use more than one, you can call this action blank and let the use choose which leaderboard he / she wants to see. In order to add a new achievement, select the “Achievement” tab and click on “Add new achievement”. You have to add at least 5 achievements before you can publish your Play Service. Enter all needed information and an icon (512 x 512 px, png) and click on save. Then copy the ID and use it to “Submit an Achievement” in your Construct 2 project. 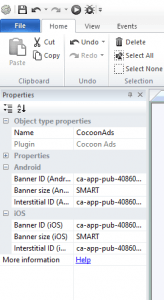 Add the ‘Cocoon InApps’ plugin to your project (you must have installed the AtomicPlugins by ludei). Please login to your Google Play Dev. Console and select your game. Then select “InApp Products”. If this is your first visit of this tap you may need to connect your Merchant Account with your Developer Console. If you don’t know how to connect your merchant account with your developer console, please visit this link. If your account is connected, then click on ‘+ Add new Product’. If an item is set as managed it only can be purchased once from the player. This is recommended for perks like “Remove Ads” or something like that. All managed products can be restored by using the “Restore” action from the CocoonInApp plugin. If you want to allow multiple purchase of a managed product, you have to consume it after the purchase. This is needed if you want to offer in-game currencies like coins, gems or something like that. An subscription isntead is a recurring purchase depending on the set time interval. You can use this kind of item for a “Premium” perk. Aslong the player pays the recurring fees he is a premium user, once he stops, he will loose the state of being premium (and all benefits of being a permium user). Please note, up to now Subscriptions aren’t supported by the Google Play InApp plugin! 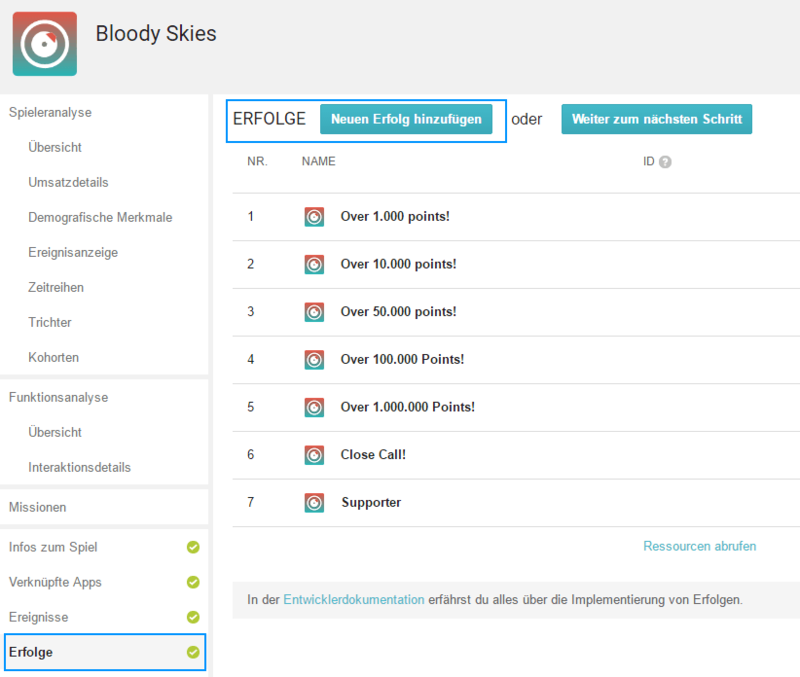 Confirm the dialog and enter all needed information about the perk, like prices and the description. Once you are done click on Save & Activate. Just add your ID there (Product 1 = removeads for instance). You can download our free capx examples here. 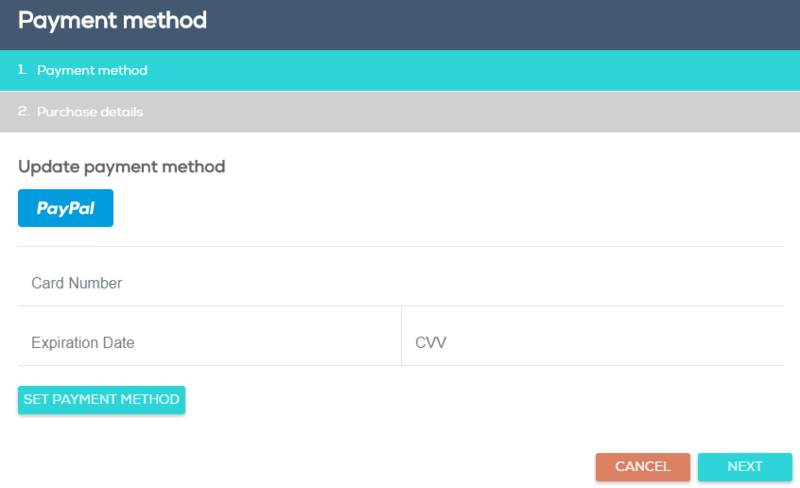 There you will find a complete code example for the InApp Purchase Function. If you don’t know how to get started, feel free to download our free code example. Here you find all needed information for the actions. On the start of the Layout check if “Is Canvas+” && “Is store avaiable” are true, before you call “Fetch Products from Store”. It’s not needed to fetch the products on each reload of the layout. To avoid this, I added a “isFirstStart” variable. This variable will be set to 0 (false) if “On fetch products completed” was triggered. So the products get fetched only on each “first” start of the game. You must pass a comma separated list of your product_ID’s. I’m using variables to store my ID’s. If you do not use variables (what’s not recommended) you can add it also like this. This action will either trigger “On Products fetch completed” or “On Products fetch failed“. This action will return the cached Products and will create the “product_list” which is needed to access the product description, title, price and so on. So call this action whenever you have successfully fetched your items from the store. An example is shown below. It’s no matter in which order you fetch the products. The list always will be sorted ascending from a to z based on your product ID (not the name). So an example. Then use the index (0, 1, …. x) in order to access the product details. The log will look like this then. If you want to access the CocoonInApp expressions you have to call the “Update Products List” first! You find an overview off all plugin expressions below. Opens the purchase dialog for the passed product ID (string). You either can do this by passing the ID directly (as variable or as “productid”). or with the index of the product. This depends on your function. This action will either trigger “On purchase product completed” or “On purchase product failed”. If you consume a purchased product, then it can be purchased again. This is relevant if you want to offer perks which can be purchased more than once (in game coins, power ups and so on). So whenever a purchase of such an item has completed, consume it. This action will restore all purchases from the store and then call “On purchase complete” for the relevant products. In my eyes this is currently a bug. It actually should only call “On Restore purchases completed / failed“. And set the “Is product_id purchased” to true or false. I notifed ludei about that. If there are any news, you will see it here. Here you find all needed informations for the CocoonInApp Expressions. This expression returns the currently cached products (the length of the products_list object) as integer. In order to access this value, call “Update Products List” first. This expression returns the description as string of the product at the passed index (0-based integer) from the product_list. This expression returns the product id as string of the product at the passed index (0-based integer) from the product_list. This expression returns the local price & currency as string of the product at the passed index (0-based integer) from the product_list. This expression returns the default price & currency as string of the product at the passed index (0-based integer) from the product_list. This expression returns the stock as integer of the product at the passed index (0-based integer) from the product_list. This expression returns the title as string of the product at the passed index (0-based integer) from the product_list. This expression returns the ID of the purchased product. But note, you only have access to this expression if it’s used with the triggere “On purchase … completed“. This expression returns the TransactionID of the purchased product. But note, you only have access to this expression if it’s used with the triggere “On purchase … completed“. This expression returns the date when the product was purchased as string. But note, you only have access to this expression if it’s used with the triggere “On purchase … completed“. This expression returns the quantity of the purchased product as integer. But note, you only have access to this expression if it’s used with the triggere “On purchase … completed“. If you use the CocoonInApp Plugin in your Construct 2 game, please make sure that you also install the corresponding plugin in the Cloud Compiler under Cocoon.io – Your Project – Plugins! It’s called “In-App Purchases for Google Play”, “In-App Purchases for Amazon” or “In-App Purchases for iOS App Store” depending on the used store later. 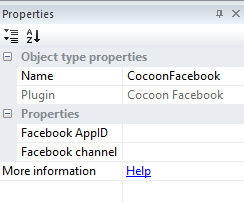 Add the ‘Cocoon Facebook’ plugin to your project (you must have installed the AtomicPlugins by ludei). 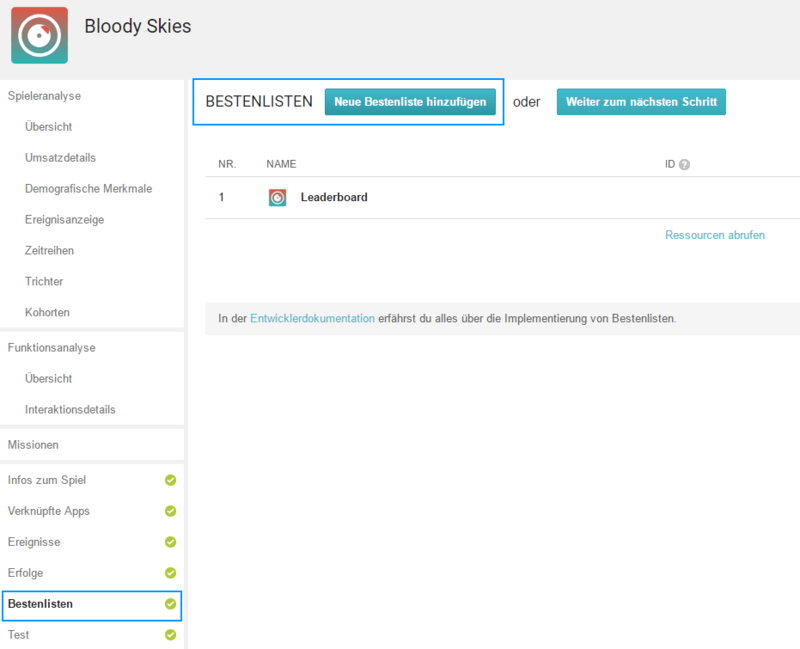 That’s the key you have to unter (replace the placeholders with your details). Add the ‘Cocoon CanvasPlus’ plugin to your project (you must have installed the AtomicPlugins by ludei). In order to use the actoins and events of the Canvas+ you must install and import the CocoonCanvasPlus Plugin for C2 by ludei first. 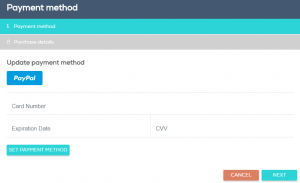 The CanvasPlus plugin offers a way to close the app (but without a dialog. You can create an exit function like this. Please import the offical browser plugin from Construct 2 into your Project. Then create following code. We also used an additional exit button for this example. So you can either call the exit by the “On Browser Back Button” or on the sprite “btnExit”. You also find that code in our Cocoon Developer Template, which is available for free over here. The CanvasPlus plugin also offers a way to interact with the player by opening an inputfield or a dialog window. You can use the dialog window for an exit message for instance (see first tab). If you feel ready to publish your game, just follow the steps below. We guide you through the complete process. is it capable to use analytics plugin ? You can add every feature to construct as Plugin / Behavior. 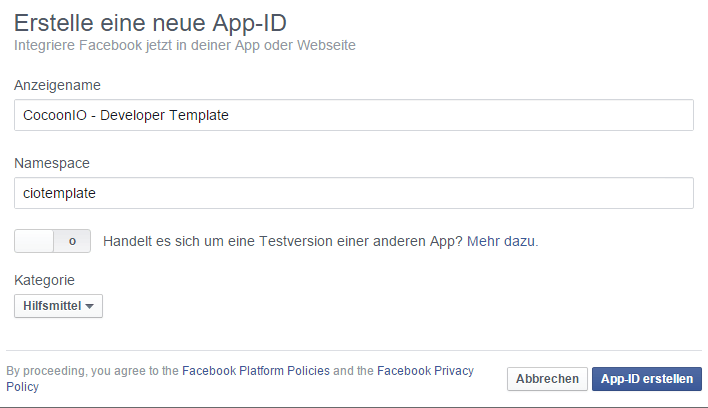 I know that there is already a plugin for Google Analytics, but not for the Facebook Event API. But basically it’s possible with c2. The leaderboard doesn’t work. It tries to login but nothing happens. I tried everything. Can you please help? Have you setup your play service completely? You musst assign an apk file to your play service. Then ensure that your test apk has the same bundle ID then the associated one. If you need further help, please visit our forum here. Yes, I did! And it even starts to login but then it closes the login screen and nothing happens. I tried to export as Webview+, as Canvas+….everything. 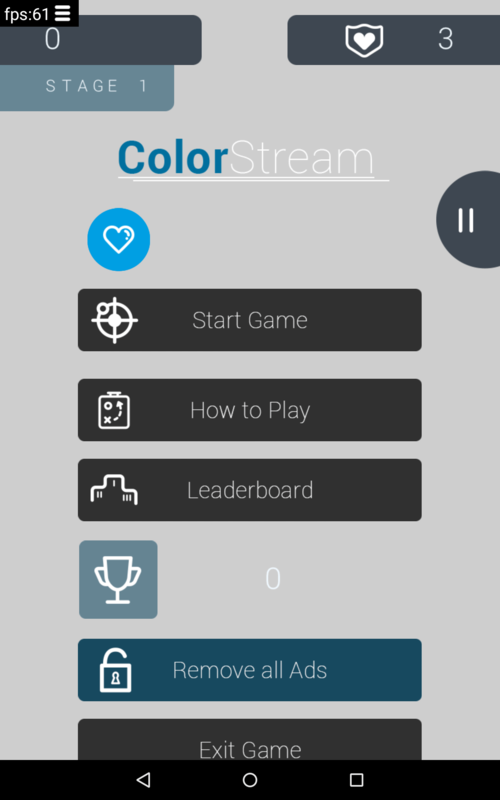 I am using CocoonGooglePlayGames plugin in C2. Does Coccon.io in app purchases also work for iOS as well as Google Play? Yes it does 😉 Just use the same InApp ID’s on both platforms. 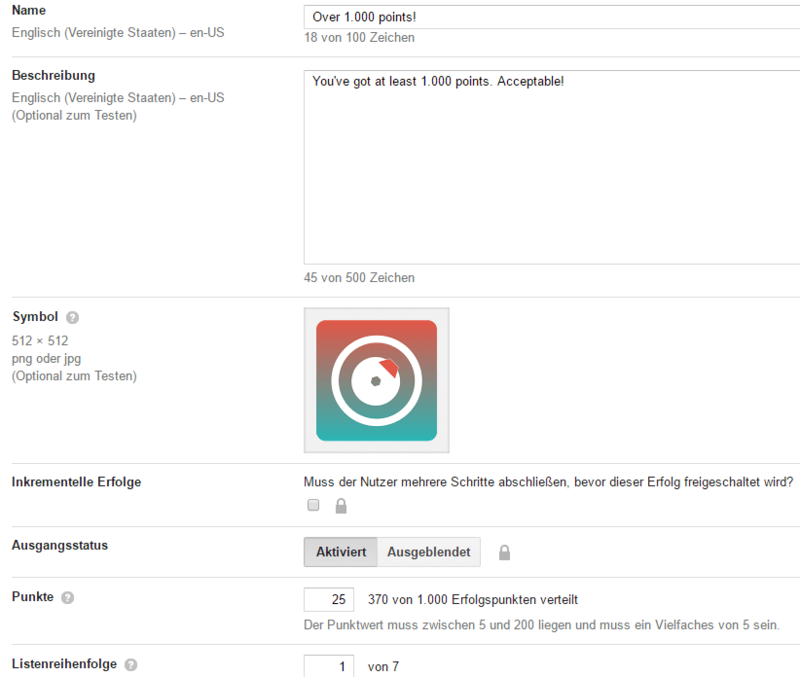 Facebook Plugin. What is that CHANNEL LINK. in cocoonPlugin in C2. 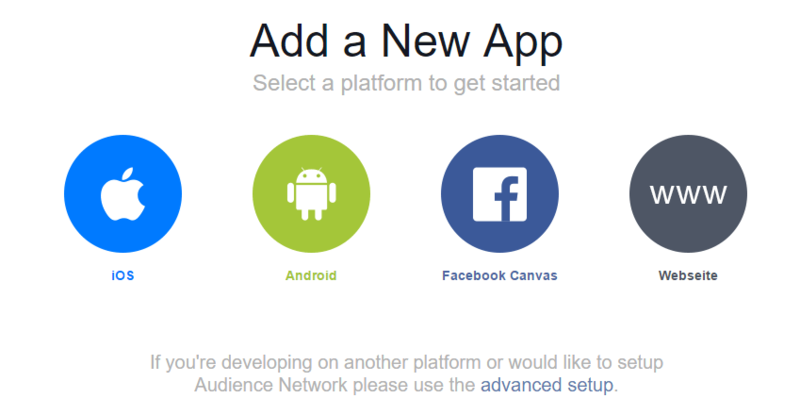 Is that created application pages to facebook or what? Why those plugin installed in cocoon are so huge. They are bigger than my app. Its 100 mb, is it ok with that? That‘s not normal. I did install all plugins by cocoon and my app has a download size of about 15 MB. Can you check it again? 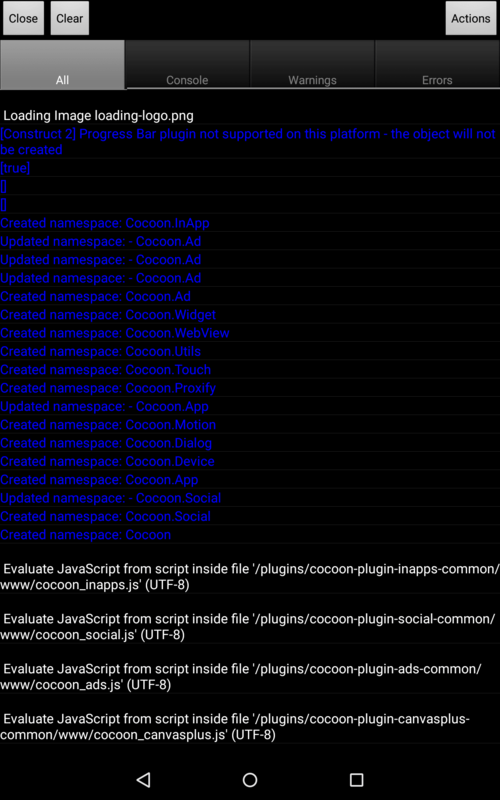 Ok I have Cocoon CanvasPlus but I can’t find newest AtomicPlugins by ludei. Maybe this is cousing button problem. I can’t click it. thank you very much! I‘m glad that my guide was helpful for you. CocoonJS is an older cloud compiler by ludei. Since CocoonIO was released, ludei is using Cordova for it‘s compiler. 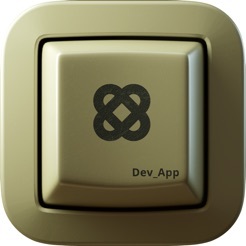 This allows to install all cordova plugins to your project. However, I had an issue with my game on Android in that it would close the game if I accidentally touched the back button on my phone, so I added in a bit of code using the browser plugin that vibrates the phone if you touch the back button (Overrides the closing). I note that this action isn’t available with the CanvasPlus. Do I need to replace all functions or just those that are included in this new plugin? thanks for your comment. I never had the issue that the game closes when touching the back button of my device. The guide isn’t 100% clear about this, I have to admit. Not all browser functions need to be replaced. Only the one for closing and for opening any URLs. So “On back button” does work on Canvas+ and WebView+. As you already have thought, you only need to replace the browser function which are included in the “CocoonCanvasPlus” plugin. I’ll update the guide to make this sure! Thanks for the input. i need solution to solve it.